Samsung PS51D8000 review | What Hi-Fi? At just 4cm deep and with that luxurious bezel and pedestal, the Samsung PS51D8000 will attract more envious stares than most other sets. As with its £710 stablemate, the Samsung PS51D495, the D8000 is a 51in panel. Given its price tag it’s no surprise you get Full HD, as well as extra features such as the company’s new Real Black Filter, Cinema Smooth motion tech and 3D Sound. The D8000 has built-in wi-fi, and it’s clear from the fact that connecting to the internet is the first step in the setup process that web content is at the top of Samsung’s priority list. The brilliant new Smart Hub has a huge selection of apps, including LoveFilm, BBC iPlayer, Skype, Acetrax, Twitter, Facebook and vTuner. It even has something called Explore 3D, which gives access to 3D documentaries and trailers. The content lacks a little excitement, but it’s a good way to show off your new TV. If the Smart Hub had HD movies on demand, it would be the ultimate portal. For now, though, you’re going to have to get your HD fix the old-fashioned way. Play the Blu-ray of The Expendables and the Samsung’s strengths become clear: it has a terrifically sharp and detailed picture, so much so that it adds an extra degree of three-dimensionality and depth to the standard 2D image. However, it also has its flaws. For a start, the colour palette is much warmer than on many rivals even on the coolest setting, and this adds a garishness to the picture. Also, while contrast is perfectly decent in isolation, comparison with the very best competitors proves that the Samsung doesn’t go as deep as it could, and some detail and light are lost in the darkest scenes. Finally, motion, isn’t quite as solid or smooth as that offered by rivals. 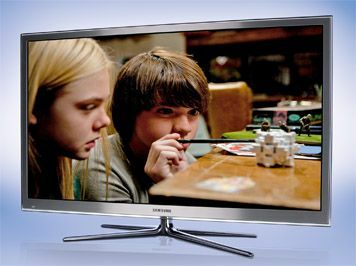 Unusually for Samsung, the D8000 has Freeview HD and Freesat tuners, and HD broadcasts received by both are sharp and well-defined, while standard-def is clean whether you’re getting it from one of the tuners, a DVD or an on-demand movie service. The problem is that these sources also suffer from that relative lack of motion control, contrast and colour balance. Weirdly, however, 3D Blu-rays don’t. Play Avatar and the D8000 provides a stunningly sharp and immersive picture, with the cryogenic sleep chamber seeming to stretch for miles and the complicated internal beams and struts appearing pin sharp and free of double-imaging. What’s most interesting is that the colour balance is inexplicably more neutral here than with 2D, while whites are punchier and purer than those served up by its rivals. Even motion, while not perfect, is closer to its rivals with 3D than it is with 2D. So, if 3D matters to you over all else, the Samsung is well worth seeing; for those who still value 2D (99.9 per cent of you, we suspect), there are better sets.